A slightly revised version of this article was first posted nearly two years ago. However in the wake of events in Oxford last night, where protestors disrupted a debate about “free speech” involving Griffin. And in view of renewed rioting in areas of Paris mainly populated by immigrants in the last few nights, we though it highly pertinent. Ed. The acquittal and retrial of British National Party leaders on charges of inciting “racial hatred” was the lead item on BBC TV News broadcasts (1) Thursday night. Followed immediately by a report on the furore (2) in the Muslim community caused by cartoons depicting Mohammad. On the face of it this might seem perfectly reasonable journalism but the juxtaposition of the two as lead items, when far more important things are going on – such as the war in Iraq or the possibility of an attack on Iran – reveals a darker agenda altogether. First and foremost it must be pointed out that enmity between various groups is being deliberately fostered, no matter what the authorities say, and much of this is being done under the guise of “press freedom”. It’s a variation on the old theme of divide and rule and the juxtaposition and prominence given to these two stories is a perfect example of just how this is being done. Nobody in the mainstream media will question why such a relatively unimportant item like the BNP story was given such prominence. Nor will they question why it was immediately followed by a story that in contrast seems almost guaranteed to provoke further friction and enmity. Although that may have been the intention, don’t expect the mainstream media to tell you. Its function in the emerging New World Order is to shape and condition public perception, and in this particular case, to foment antagonism between the Islamic world and the West. 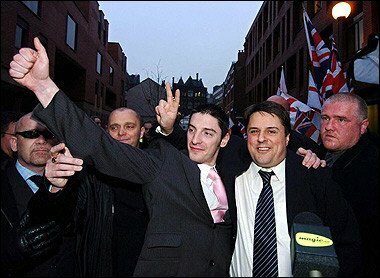 However, Nick Griffin’s acquittal and retrial is only part of a much bigger story that you won’t be hearing from the BBC. When Nick Griffin was arrested and charged some months back, a contributor to this website, Dave Starbuck who personally knows Griffin, informed me that the trial would be a “show trial” and that Griffin would be acquitted. Sure enough he was: but to ensure that tension between various ethnic groups remains high, Griffin now faces a retrial. The authorities are, in a sense, furthering fuelling the fires of tension and enmity with the retrial. Either way, like George Bush (4) he’s very much a pawn for the powers that be. At the behest of British Intelligence, he took control of the party in an effort to neutralise what may have become a genuine stumbling block to the New World Order. He also made a point of banning Dave’s adverts promoting alternative health remedies and alternative views of history from the party’s publication. So Nick Griffin is no more than a stooge for the ruling elite and the prominence given to his acquittal and subsequent retrial are ploys to foment further internecine antagonism. While Griffin’s acquittal was given much coverage, it was followed by another report that when seen in contrast seemed guaranteed to heighten tension still further. As Griffin’s court appearance was playing out a series of cartoons appeared across Europe that incited anger among Muslims. That may have been the intention, although don’t expect the mainstream media to tell you. Muslims consider any depiction of Mohammad blasphemous but overnight cartoons featuring Muhammad appeared across Europe. Newspapers in France, Germany, Spain (5), Switzerland and Hungary all reprinted caricatures originally published in Denmark, while the BBC announced (6) that it too would broadcast the cartoons of the prophet. The following day the Independent ran the two stories together on its front page, and asked “What price free speech”? While the Daily Express also ran both stories together on its front page under the headline: “The Price of Free Speech”. Of course, it’s nothing of the kind. Far from being an expression of “Free Speech” it was an example of modern psychological warfare. A Psy-Ops carried out under the veil of a supposedly “free press” and intended to foment distrust and enmity between the Muslim world and ordinary Westerners. Moreover, the seeds of this operation were first laid over a century ago. When satanic prophet and one of modern freemasonry’s founders, Albert Pike, first outlined a plan for three world wars (7). According to Pike, agents of the Illuminati would provoke conflict between Britain and Germany leading to the First World War and the overthrow of Imperial Russia, turning Russia into a “fortress of atheistic communism”. The Second World War was to be fomented by taking advantage of the differences between fascists and political Zionists, wrote Pike. Leading ultimately to the destruction of Nazism and the establishment of “a sovereign state of Israel in Palestine”. These events have already occurred exactly as Albert Pike envisioned over a century ago, so perhaps we should take note of his vision of a Third World War. Unfortunately, there’s worse to come because all this was intended as a prelude the rule of Satan, Pike wrote (8). So don’t say you haven’t been warned and don’t think it will end with the next terror atrocity, staged or otherwise. Unless people start waking up from their media induced apathy and illusions, things could be about to get much, much nastier. Although don’t expect the BBC to tell you, they’ll probably be too busy with televised celebrations to mark the inauguration of the planets new ruler. (8) Who was Albert Pike?